3 CDs. 3:44 hrs. Dreamscape. Jan. 2018. $29.99. ISBN 9781520090948. digital download. 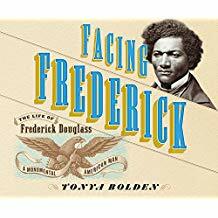 Gr 7 Up—Bolden's fact-packed biography of one of America's most influential African Americans presents Frederick Douglass's tireless work as an abolitionist, but it also enumerates his successes and failures as a publisher, professional alliances and disunities, involvement with suffrage, extraordinary travels, and family life. Sources are noted in the narration with scrupulous detail. A time line presenting previously unmentioned facts is offered at the end. Adam Lazarre-White's voice is extremely rich in tone—perhaps a nod to Douglass's speaking voice, which Bolden describes as sonorous. Though at times halting and out of rhythm, the narration adds to the seriousness of the subject's accomplishments and the unspeakable injustices of his time. What the work lacks in insights into Douglass's personality and humanness, it balances with extraordinary details of his impact on humanity. VERDICT Students of the time period, American history, and social movements will find it valuable to absorb the details of Douglass's extraordinary life.